Nothing goes unnoticed in Yelena Akhtiorskaya's satire of an immigrant family, and nothing is sacred. Above: Old suitcase lock image from Shutterstock.com. There are certain novelists whose powers of observation are so acute, you barely notice that their characters' inner lives are illuminated mostly through their actions in relation to others and the world. You only occasionally glimpse a character's internal thought process—everything is surfaces and relationships. This is a behaviorist's approach to psychology, a nearly cinematic approach to novels. I'm thinking of Sinclair Lewis, Charles Dickens and Mark Twain. 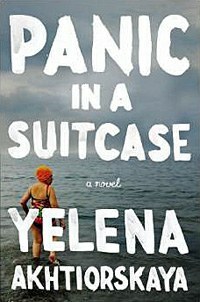 Yelena Akhtiorskaya's debut novel, Panic in a Suitcase falls within this narrative tradition, observing and satirizing Brighton Beach and Odessa through the story of a poet and his family and friends. Nothing goes unnoticed in the world of her novel, and nothing is sacred. The story begins in 1993, two years after Esther and Robert Nasmertov leave Odessa to settle in a Russian and Ukrainian enclave in Brighton Beach. They live with their daughter Marina, Marina's entry level coder husband Levik, and their granddaughter Frida. The household is stirred up when Esther is diagnosed with cancer and Marina pays the airfare for her brother Pasha, a 37-year-old poet, to visit for a month. The novel's plot is fairly thin, but Akhtiorskaya's spectacular voice and uncanny ability to spot the absurdity in everything compensate for this. The central conflict of the novel in the first half is Pasha's difficult relationship with his family. The most vital character in Panic in a Suitcase (and one of two with significant interiority) is Pasha, who is semi-incompetent at ordinary living. While the rest of his family immigrates, Pasha stays put in Odessa, forgetting to buy a ticket to visit and getting into various accidents. Once Pasha does visit his immigrant family in 1993, he sours on Brighton Beach quickly, realizing that immigrants from his country haven't "ventured bravely into a new land" but instead have made a "tidy replication of the messy, imperfect original they'd gone through so many hurdles to escape." Akhtiorskaya renders Pasha, particularly how he moves through the world, in exquisite detail. He is slow to get ready for the beach, not due to a leisurely temperament but because "his brain and body had long ago, perhaps at birth, suffered a breach, leaving his body on auto pilot." He has hurt the family by converting to Christianity—his mother considers his conversion process "an elaborate theater of spite." He has the constitution of a poet—he is unreasonably tall due to consumption of parsnips, sickly with a spooky gaze and a nose and ears that are disproportionately large for his head. Similarly vivid physical descriptions are given of Esther whose face gives off a "postmenopausal odor, like overripe apricot flesh." Frida has "jutting globular knees" and a "sumoesque" stance. Robert, a doctor in Odessa contracts an illness and possesses an "innate shabbiness" has a chin looks like "a root vegetable that had been partially grated." We get a sense of Robert, or at least his relationship to Pasha from the fact that he starts to recite a Pushkin poem and they alternate lines. But overall, there is less weight given to the family member's internal lives, less personality or memory to root into than a reader would expect from a novel whose linguistic pleasures are so bold and memorable. While the treatment of family, seemingly the central figures of the book, stays close to the surface, the reader is pulled into the inner life of Pasha's best friend Misha, an immigrant who arrived in America "too young for the usual immigrant dance step of struggle and settle, sweat blood for two years, then fall into a respectable career" and too old "to attempt camouflage." The reader gains an intimate sense of his artistic ambitions and pretensions, among them his desperation at retaining his status as Pasha's friend in the eyes of Pasha's father and his long-term infatuation with Marina. Pasha's month-long stay includes a trip to the beach, a weekend by Lake George, a tour of Chelsea art galleries, and a literary party. The trip to the beach was excerpted in the magazine n+1, and it's a tour de force, starting with an image of the family "barricaded on one side by water and on the other by cherry pits like tiny bullets that had perforated a flock of seagulls." Levik remarks the cherries are organic. The trip is ruined by a storm with a "Slavic temperament"; it arrives with force, but is burned out in less than half an hour. The other events of the first half are similarly, intentionally anti-climactic. The lake vacation was the sort of family vacation neurotic immigrant families have—one that I recognized—where the vacation is "permission not to be themselves, and everybody would get angry whenever those selves showed up in an unsuppressed comment, an impromptu two cents" and where the vacation personality is shed on the way home. Pasha lets his family begin the immigration process on his behalf, but it slowly becomes clear that the family benefits by keeping a family member in Odessa. Pasha's presence there keeps Odessa theirs. A Harvard professor wants to translate Pasha's poems and his father tries to ensure that the opportunity for fame from his poems does not pass Pasha by. The second half of the novel occurs in 2008, after Pasha's reputation within the family has taken on mythic proportions. Frida, now a medical student, decides to attend Pasha's child's wedding in Odessa, though she has not had an interest in Pasha, nor even bothered to read his poetry about their family. Like many children who immigrate when young, Frida sees her home country as a part of her identity, while her parents think she has no connection to it. The narrator seems to agree with her parents, noting that old photos make Odessa look like a resort town and that Pasha remains a nostalgic figure to her. The story skates over the surface of the characters' lives, often choosing the pleasures of bleak, slightly exaggerated humor over emotional depth, but the author hits homeruns on every page of the novel with her clever insights about family dynamics and immigrants. In the end, I found the novel memorable more for the high-octane talent of its author and her enormously confident voice than for any of its characters or their stories, but even the most banal plot points are infused with humor and so entertainingly written, you do not want to stop reading. Akhtiorskaya's nonfiction, book reviews related to Russia (Russian aristocrats, Russian writers' wives, Russia's last imperial family), has appeared in The New Republic, but it is clear that her voice is most dazzling in the realm of fiction. This is a solid debut from an immensely gifted novelist with a sharp eye for the ridiculous and a bright literary future.